Today on The Cookie Puzzle, we have a very special guest. April is Autism Awareness Month, and today is the last day of April, so it seems only fitting that I have an Autism related post. Last year, I went all out and hosted a "I am Blogging for Autism Awareness" EVENT, every day of the month had an Autism Awareness Post, Guest hosted by a different blogger. This year, I did not have it in me to coordinate such an event, maybe next year I will try it again. Anyway....I will now turn my blog over to Stephanie. 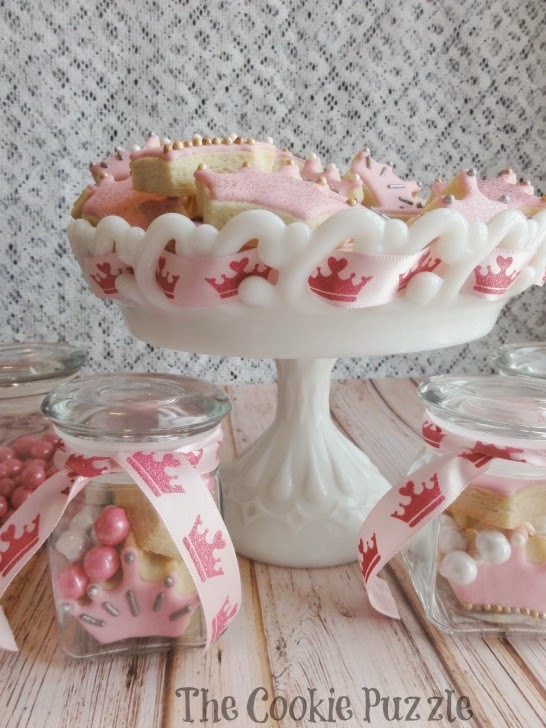 Stephanie blogs over at Ellie's Bites Decorated Cookies, she is MEGA talented. She make AMAZING cookies like These, and These and THESE! So...I love Stephanie...she is a great friend..and has two of the most adorable kiddos on the planet! Hi! I'm Stephanie from Ellie's Bites. I'm honored that Kim let me take over her page again this year! Last year, I made these but I didn't get a chance to actually make anything to send to Cookies For iPads. This year, I made a promise to myself that I would send some cookies out, and although I only made nine cookies, I did it. AND I made a tutorial, AND I talked Kim into letting me share it with you! 4. An airbrush or Wilton's color mist in a color that complements and will show up well on your base coat. 5. 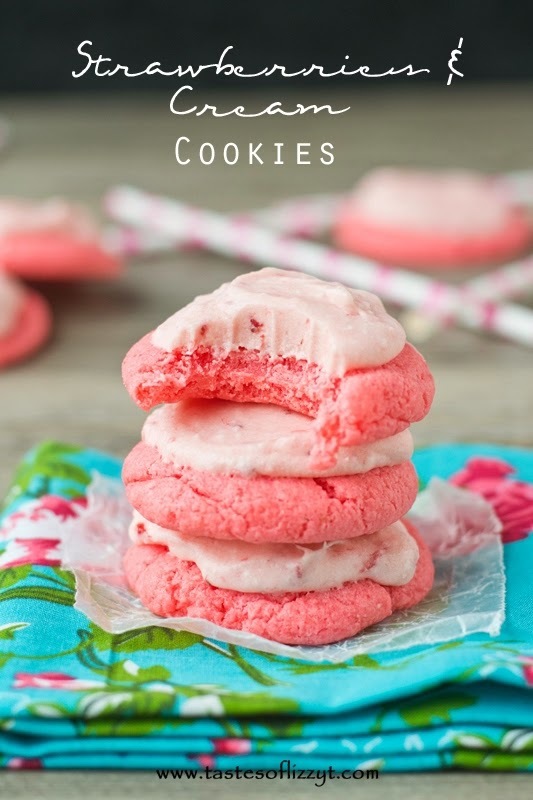 Piping icing in the same color as, or a complementary color of, your cookie's base coat. 1- Using the Press and Seal, wrap your puzzle piece. Make sure to press it into the contours. This will protect the puzzle piece from the spray, and also protect the cookies from the grimy fingerprints that your children have surely left all over that puzzle piece. 2- Lay the puzzle piece in the center of the cookie, hold it in place with the handle of a paintbrush, or a chopstick, and lightly spray over it with the airbrush color. 3- I went over a second time keeping a smaller diameter in the second pass in order to make a shaded effect on the cookie. Carefully remove the puzzle piece. Wait a few minutes for the color to dry. 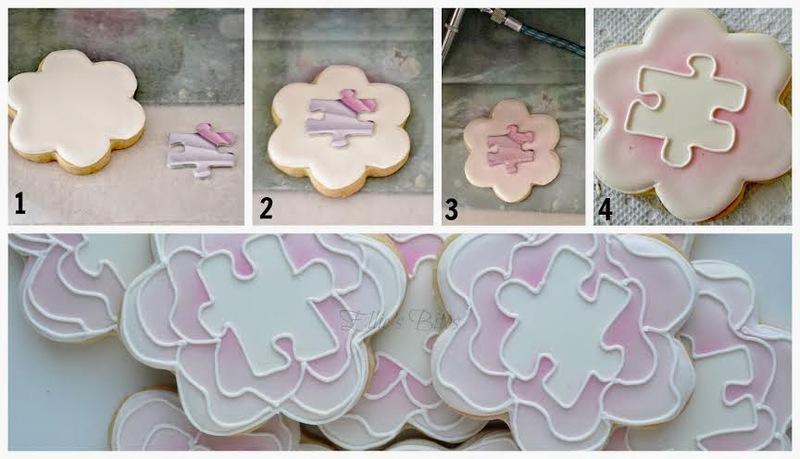 4- Use the piping icing to outline the shape of the puzzle. You can stop there. I kept going and made my cookie the shape of a rose. Thank you Kim, for letting me share with you today! Thank you so much Stephanie! I love these cookies...and you too! You all know that I am HUGE supporter of Cookies for iPads, right? 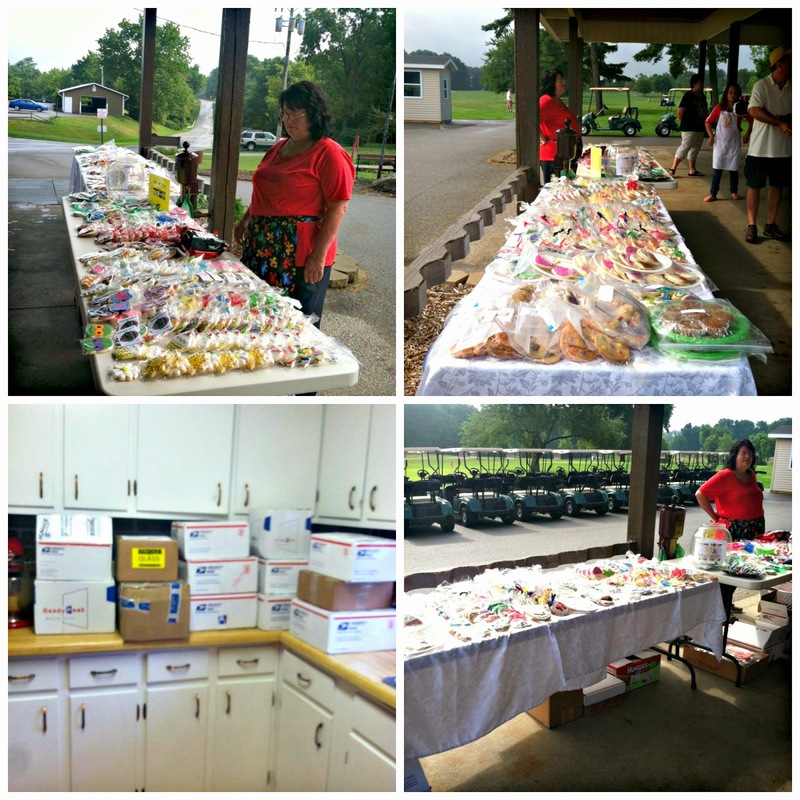 Well on Saturday, April 26th, they held their annual COOKIEPALOOZA! I live hundreds of miles from them, but send cookies as often as I can, so you know I sent cookies for Cookiepalooza! I wanted something that was quick and easy, that would ship well, and something that reflected Autism. When I saw Taste of Lizzy T post a Chocolate Chip Cut Out Cookie, I knew I found the cookie I wanted to make! The logo for Cookies for iPads, is a chocolate chip cookie with puzzle pieces on it. And by now, you should all know how I fell about Puzzle pieces, so this past week, I shipped a box that contained 136 of these! 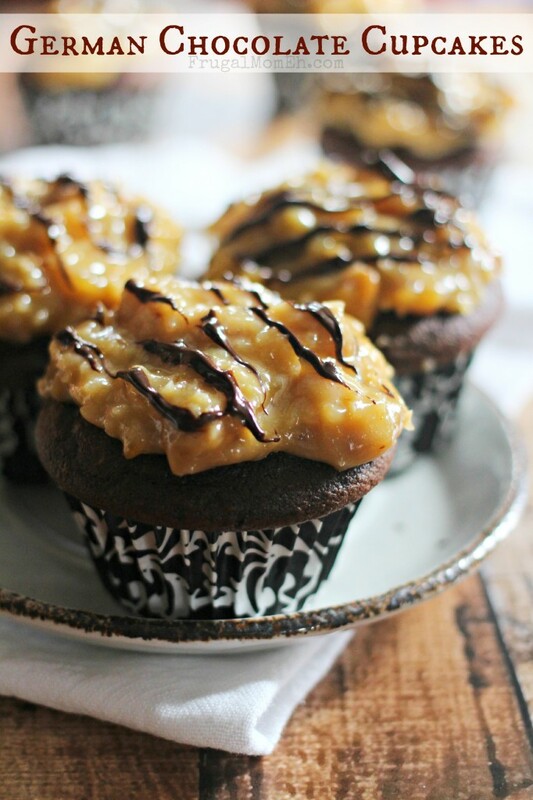 They are sooooo yummy, and soooo easy! 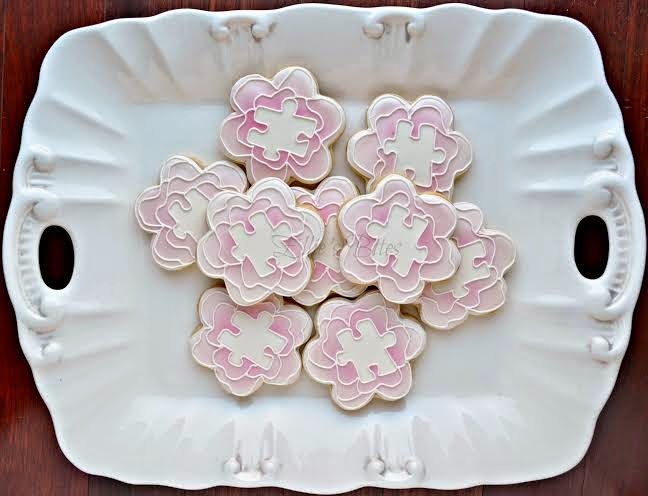 I cut some with a puzzle piece cutter, and the others I cut with a round cutter, and then before I baked them, I put some fondant puzzle pieces on them. 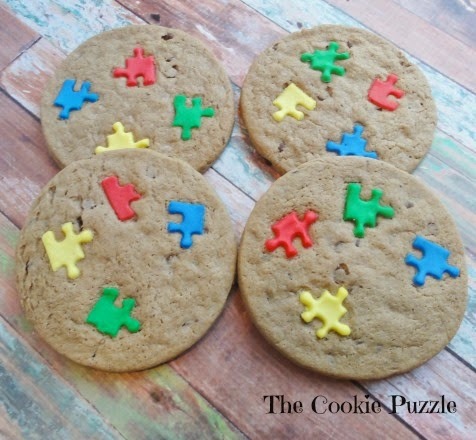 Once baked, the puzzle pieces adhered to the cookie and I had PUZZLE CHIP COOKIES! I want to take a minute to talk about these fondant puzzle pieces, in case you want to make them yourself too. I used THIS cutter, and THIS fondant. I don't have much experience with Fondant, but for this project, it worked great. I loved that I did not have to color it myself, just roll, cut and go. I spent a few hours making these puzzle pieces, and if stored in an air tight container, they last FOREVER. Now, lets talk about how I got them to stick. On my first 'try' I baked the cookies, and then put the puzzle pieces on the hot cookies as soon as they came out of the oven. It appeared to work, but when I moved the cookies, the popped off. SO...plan B was to put the puzzle pieces on BEFORE I baked them. I have to confess, I was not sure it would work, I was sure they would melt into colored globes, but guess what? It worked, they stayed perfectly shaped, and did not pop off the cookies when they cooled! WOOT WOOT! 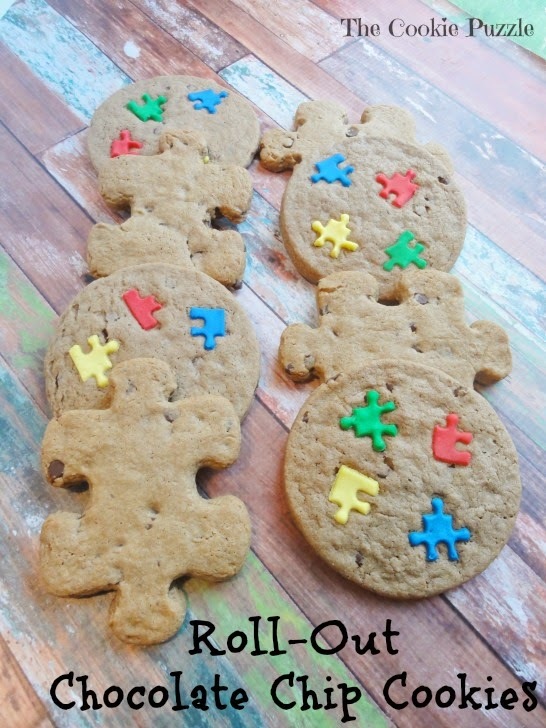 puzzle shaped chocolate chip cookies! I was not sure how these would come out...but, ya'll....I love them! 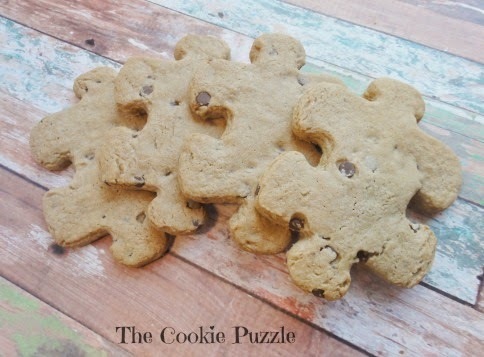 Chocolate chip cookies in the shape of a puzzle piece, how can you NOT love that. came out of the oven, I fell in love with them, and left them as they were. actually TASTE like chocolate chip cookies. 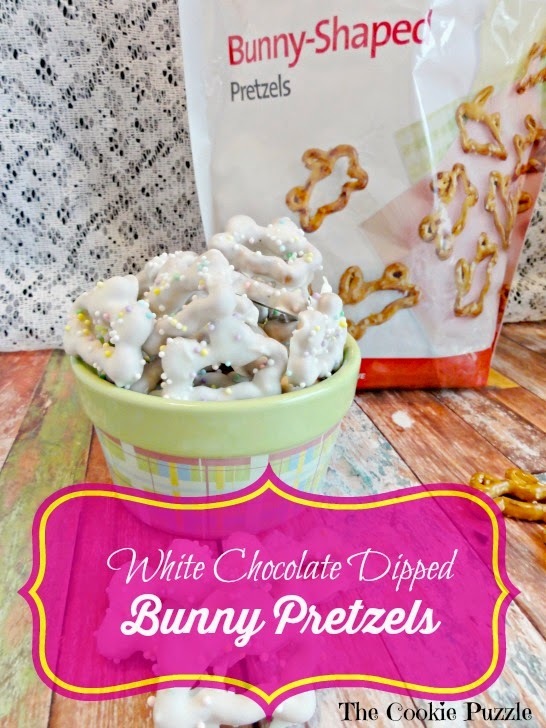 Try them sometime...I am sure you will love them! In a microwave safe bowl, melt Almond Bark according to package directions, set aside. In bowl of mixer, cream together sugar, shortening, eggs, salt and vanilla. 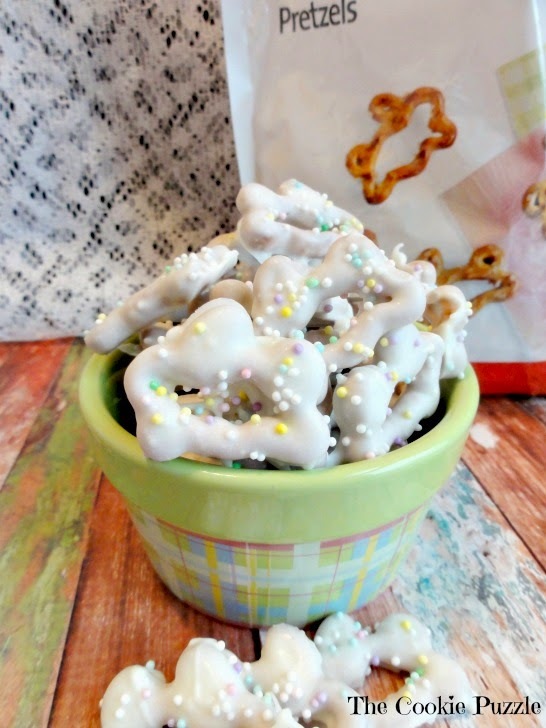 Add melted Almond Bark to sugar mixture and mix until well combined. Combine baking soda with flour, and mix well. Alternately add sour cream and flour mixture to the sugar mixture, mix well. Stir in chocolate chips. Divide dough in half, wrap in cling wrap, flatten, and place in refrigerator to chill for at least 6 hours, I chilled it overnight. Remove half of the dough, and roll 1/4 inch thick, and use favorite cutter to cut out cookies. Re-roll any scrapes, if the dough becomes soft, put it back into the fridge to chill, the dough is much easier to work with when it is cold. Bake in a 350 degree oven for 8-12 minutes depending on the size of the cookie. Cookies are done,when the edges just start to brown, and center is slightly firm to the touch. Cool completely on cookie sheet, then remove to an air tight container to store. Today is a big day at The Cookie Puzzle. Do you see the cool graphics? wonderful Anyonita of Anyonita Nibbles. has been one of my favorites! When I noticed a call for new co-hosts, I nervously sent in my application and information. You can imagine my surprise when I got an email back. Just imagine a high pitched squeal and a well protected iPad, flying across the room. 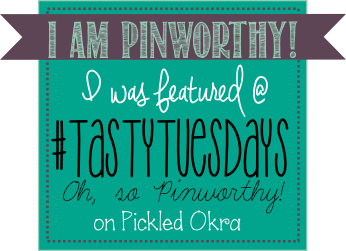 So...here we are, and here we will be, every Tuesday! 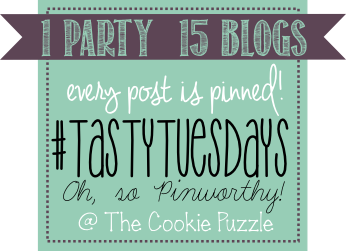 A Tasty Tuesday Link Party at The Cookie Puzzle! co-hosts provides this fabulous party. feature some of my favorite posts from that party. You don't mind, do you? I think that S'Mores are the perfect food. 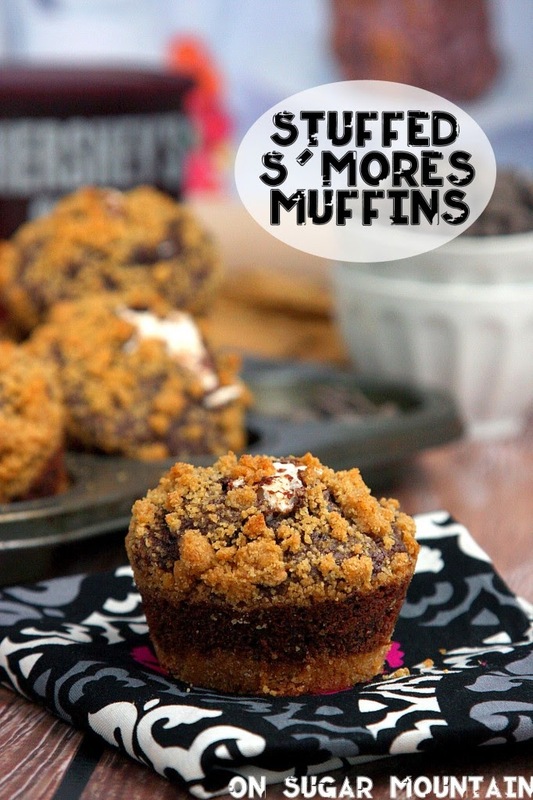 These Stuffed S'Mores Muffins make my heart sing! bread and dessert, that is a perfect meal in my opinion. These Garlic Biscuit Knots look Amazing! the thought of having to fold those paper thin wanton wrappers scared me. 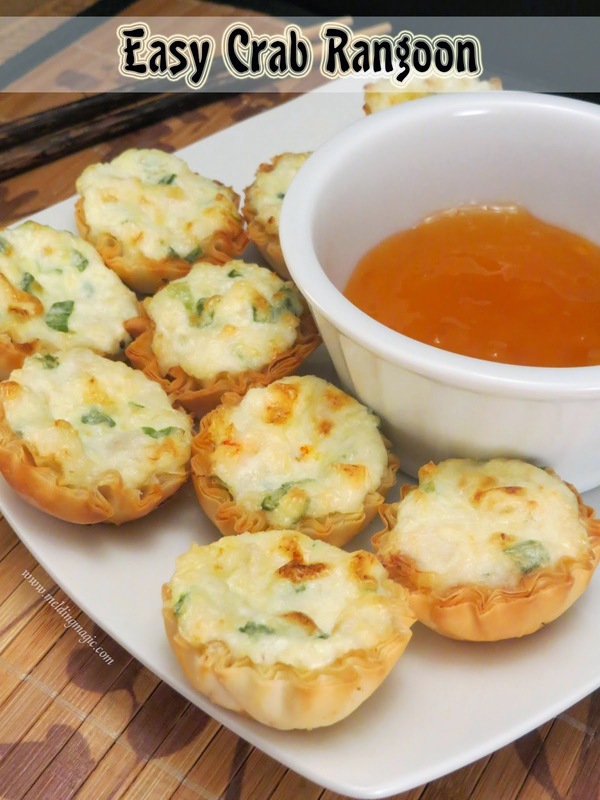 they look yummy and are easy to make. 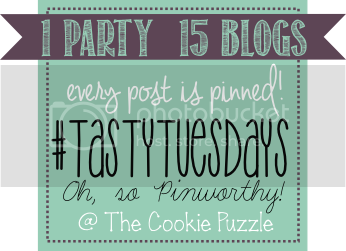 Today is a very special day here at The Cookie Puzzle! 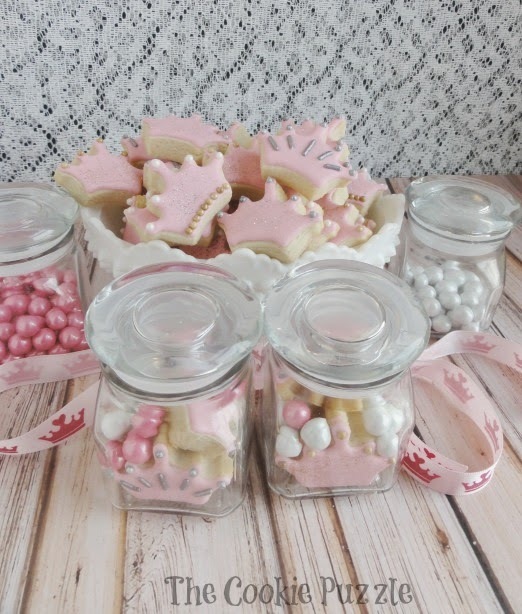 Her Royal Highness Baby shower! Who is the Baby Shower for? take home with you. Use your imagination. Callye and Georganne both gave birth last week to beautiful little girls. 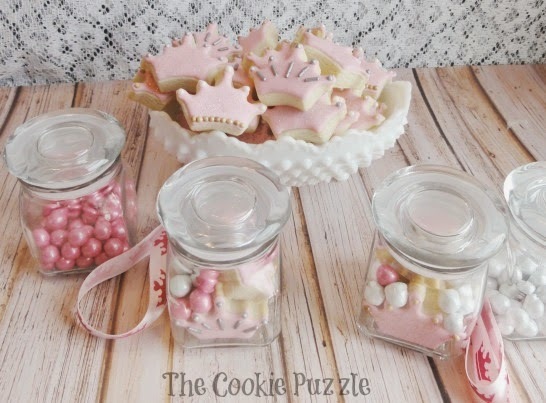 to be little cookie princesses. 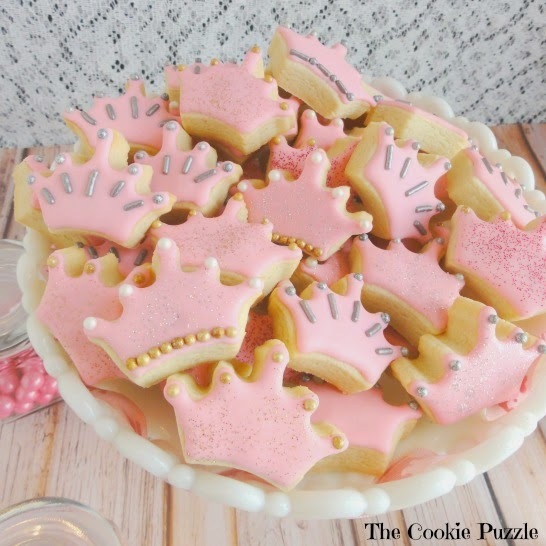 Now....let's look at all of the Royal Cookies the other attendees made! to be included in this Royal Event! Here at The Cookie Puzzle, I am all about quick and simple. a month ago, when Easter stuff first made it's appearence in the stores. I wanted to blog about them, then LIFE happened. 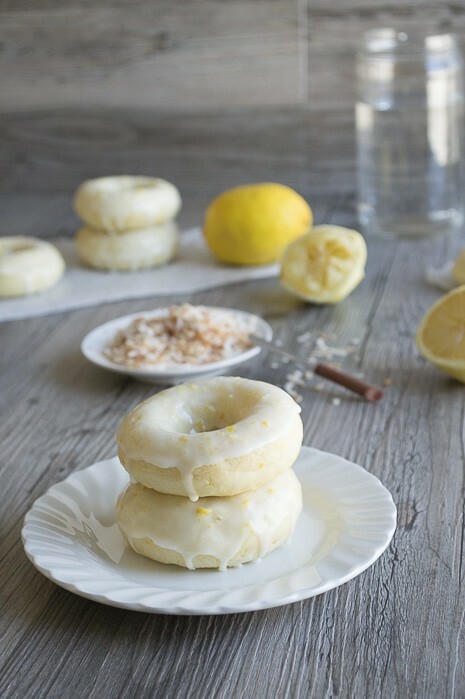 I dipped these in Candiquick. This is my first time using it, and I AM IN LOVE! tastes AMAZING! I highly recommend it! Attention Bakers!! Our Third Annual "Light the Night with Hope" lantern lighting for April Autism Awareness Month will be Saturday April 26th. This is the biggest event of the year and we need cookies for Cookiepalooza! 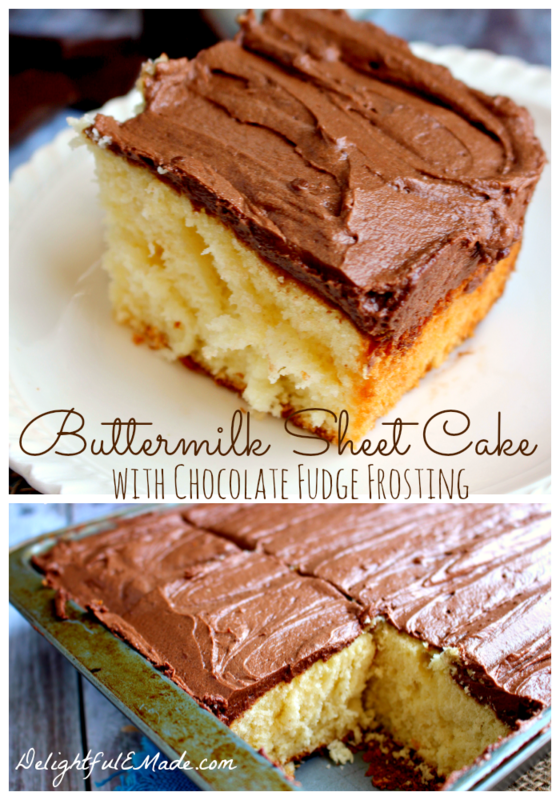 If you can bake this year, please mark your calendars. All shipments can be sent to: SBS c/o Cookies for iPads 800 Park Ave W. Mansfield,OH 44906. Please share with all bakers! Cookies for iPads is very near and dear to my heart! If you look on my navigation bar, you will see a whole page dedicated to them, see it? Here it is! 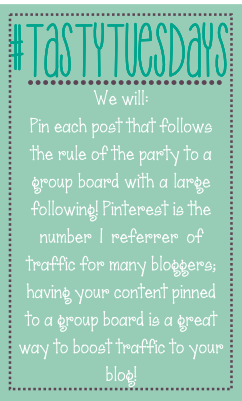 I have featured them on my blog several time, Melissa, the founder, did a guest post last year, you can read it HERE! If I could describe them in one word, it would be AMAZING! 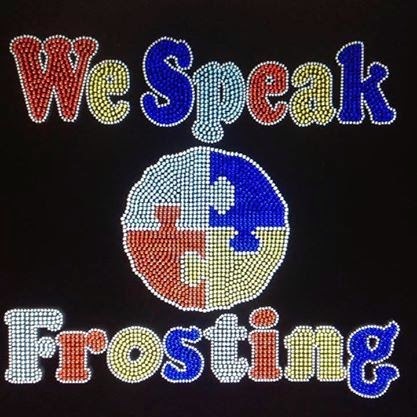 Here is the low down on them, they bake cookies, sell cookies, use the money to purchase iPads for children with Autism. How cool is that? Pretty cool I think! With their annual Cookiepalooza quickly coming up, I am putting the call out once again! I am using my blog and Facebook page, asking, asking and shamelessly begging for help for Cookies for iPads. Today, I am giving you three options to choose from, if you are willing and able to help this wonderful organization. The bake sale is Saturday, April 26th, in Ohio. They will take ANY and ALL baked goods, they are not picky. Do you bake a wonderful chocolate chip cookie? Send it! Do you have a favorite banana bread recipe? SEND it! The point being, if you love to bake, and want to help this amazing organization, bake and send it, they will greatly appreciate it! Do you LOVE Thirty-One products? 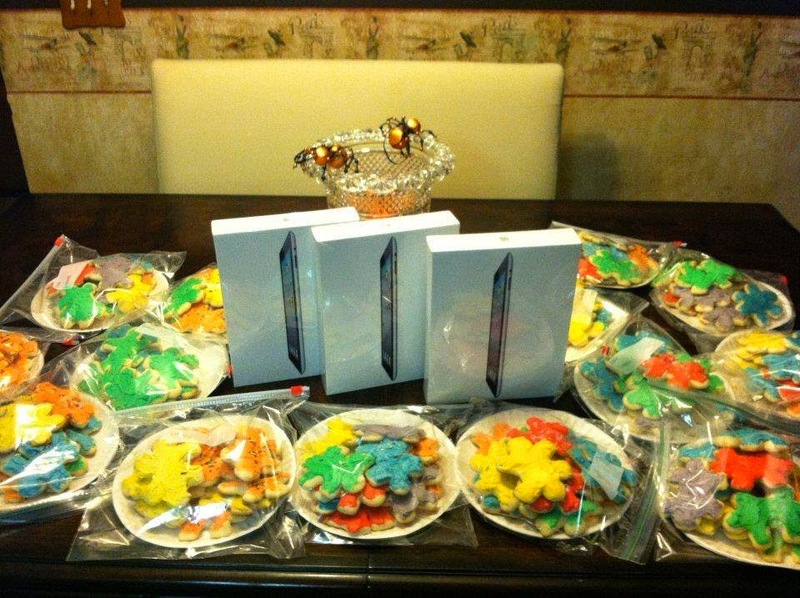 Do you want to help out Cookies for iPads? Great....I am here to make it easy for you! I am hosting a Thirty-One Fundraiser party! If you make a purchase, 20% of the total party will be donated to Cookies for iPads. We are leaving the party up until April 28th, so you have time to decide what you want. I am pretty new to Thirty-One products, having just placed my first order, but I can tell you, I am in LOVE with them! They are so well made, and the colors and patterns make my heart SING! 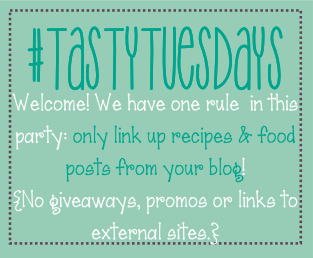 A special shout out to Melissa from My Recent Favorite Reads, for all of her help with this party! 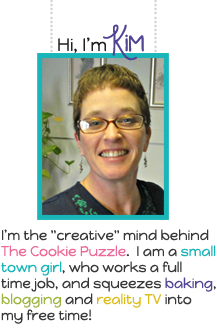 She is our consultant, a fellow blogger and a Autism Warrior Mom! Thank you so much Melissa! If you are not a baker, and don't need/want a Thirty-One Product, you can still help. Now that I have told you how your can help this organization, I thought I would share some personal experiences with Cookies for iPads. In October of 2012, I received a package in the mail, with a card. I was expecting some t-shirts I had ordered from Cookies for iPads, but I was shocked at the card in the box! Yes, in the box was not t-shirts, but an iPad for Collin! Did you read that note carefully? 20 iPads were given out! 20 iPads! How did they do that? Well, when I found out they were having their annual Cookiepalooza Bake Sale, I put the word out! 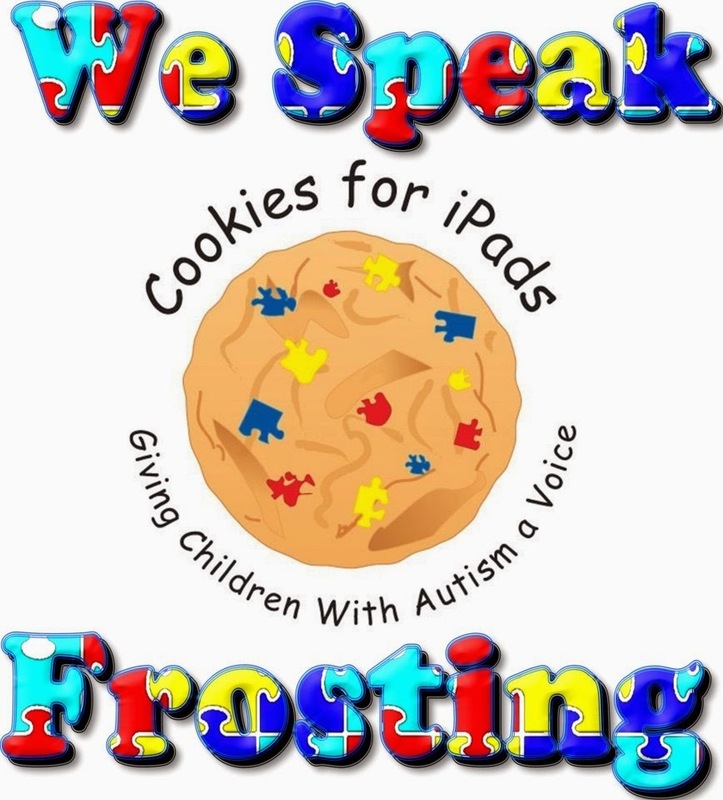 I contacted all my cookie and baking friends, asking if they would be willing to bake cookies and send them to Cookies for iPads, the response was OVERWHELMING! Personally, I find this just AMAZING! And I want it to happen again this year! I was chatting with Melissa, from Cookies for iPads, and the need this year is just as big, if not bigger. They have also expanded the areas they help with, they want to help put in a playground at the Autism School, and send a couple special kiddos to camp. So the need is great, and the bakers are few, so I am asking for help. Bake, buy, support, spread the word....do what you can...every little bit helps! 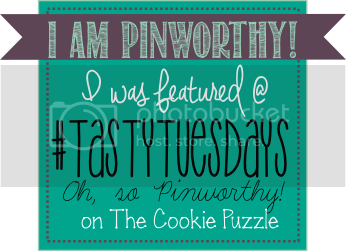 If you are a supporter of Cookies for iPads, I had the amazing Melanie from Adorability Designs, create this cute little button for me, feel free to grab it, and display it on your blog.....it will direct your readers to the Cookies for iPads Facebook page.